Regeneration and development in Kent Thameside is happening over a long period – the next 25 years or so. It is impossible for the whole Fastrack network to be delivered in one go. Development occurring at various times on at least 10 major sites spread across Kent Thameside requires careful planning and a phased approach to delivery of Fastrack. The challenge is to ensure that Fastrack services are available at the right time – when new homes on development sites are first being occupied. Over such a long period it is impossible to predict precisely when and where each route will be required, particularly since future development rates are likely to be subject to fluctuations in the housing and property markets. 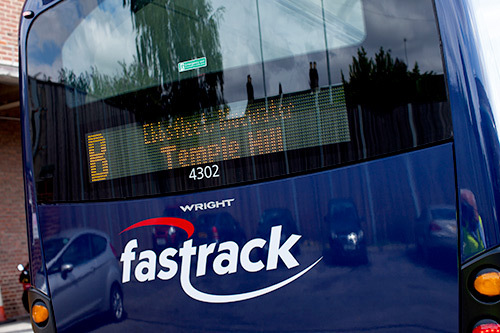 However, based on reasonable assumptions, the Fastrack services and the network are expected to grow over time, ultimately leading to a 40km network of busways and priority lanes with four Fastrack routes operating across Kent Thameside by around 2025. Good progress has already been made. Fastrack Route B, the first of three routes to be introduced across Kent Thameside, started in March 2006. Linking existing communities with current key destinations and transport interchanges in Kent Thameside, Route B has proved extremely popular. Subsequent routes are primarily intended to provide connections with major new development sites. The first, Route A, started in June 2007 providing links to and from The Bridge development in Dartford.